Does the company publish a list of the smelters and refiners it deals with? Armed groups in the Democratic Republic of Congo (DRC) benefit from the trade of gold, tin, tungsten and tantalum (3TG) mined in the region. These minerals are used in the production of a wide variety of goods. When these minerals are sourced from the DRC region they are commonly referred to as 'Conflict Minerals', their purchase supports armed groups and is contributing to an emergency humanitarian crisis. One of the major issues here is supply chain opacity - the companies who sell us goods containing these minerals often do not know where they came from originally. The companies who produce products containing these minerals buy them in a refined form from refiners or smelters, they do not buy the ore directly. It is therefore the refining and smelting companies who must be audited to determine if they trade in conflict minerals. One of the best things the large production companies we are familiar with can do to help with this issue is to make their supply chain more transparent by publishing a full list of the refiners and smelters they deal with. 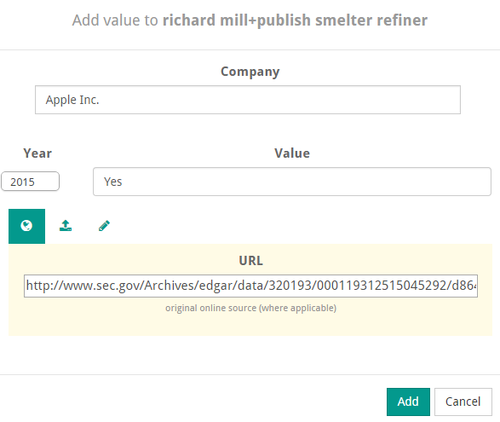 Anyone can research the appropriate metric value for a company on WikiRate by looking for a published list of their refiners and smelters and entering what they find as a metric value. When you find a published list of refiners and smelters give the company a value of "Yes", add the document containing that list as a source and set the value's year to the year when the document was published. If you search for this kind of list but don't find it, give the company a value of "No" and submit the places you looked for the list as sources. There is a methodology you can follow to conduct this search. Section 1502 of the Dodd-Frank Act mandates that companies who are registered with the United States Securities and Exchange Commission (SEC) and who use these minerals must submit a report every year describing their efforts to ensure they they are not using Conflict Minerals. If a company which files with the SEC has published a full list of refiners and smelters this is very likely to be found within the documents they submit to the SEC. Companies that don't file these reports with the SEC might still publish a list of smelters/refiners, a google search for something like "Company list of smelters" will often reveal a list. 1. 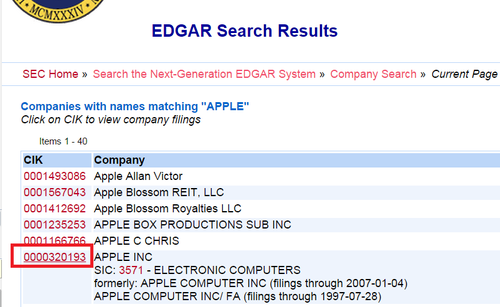 Search for the company you want to research using the EDGAR company filings search. Find the right company and click its "CIK" number. - Have a look at the related project to see which companies still require values and you might want to search for. 2. The next page may contain a lot of filings, we're looking for one which has a name like "SD" - click the Documents button for that filing. EDGAR provides a filtering function; type "SD" in the edit box "Filing type:". There may be more than one SD filing listed, one for every year since 2014. 3. Some companies only submit an SD form, others also submit a Conflict Minerals Report as an "exhibit". In Apple's case all of the information is in the Conflict Minerals Report exhibit, but for other companies you may need to check both the SD form and any exhibits associated with it. 4. If these documents contain a list of Smelters and Refiners it is usually quite easy to find (because its long) - you can use the URL of the filing document as a source, and many companies also provide a pdf version somewhere on their own website (this is actually a requirement of the Act) which you could also use as a source. 5. Add a value to this metric. If you encounter any difficulties, or spot any problems with this methodology, please leave a comment below.